44.25 mm stainless steel case, transparent back, blue tachymeter bezel, scratch-resistant sapphire crystal with anti-reflective treatment on both sides, blue dial, self-winding chronometer Omega 9300 movement with Co-Axial Escapement, chronograph, date, and small seconds, approximately 60 hours of power reserve, stainless steel bracelet. 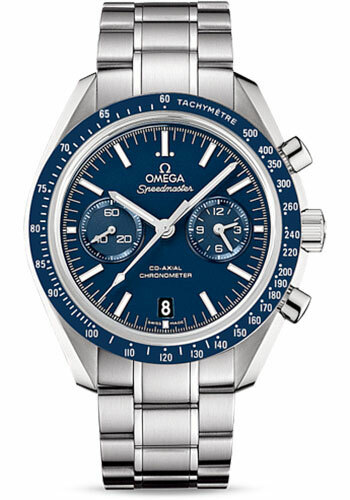 Water resistant to 100 m.
44.25 mm stainless steel case, transparent back, blue tachymeter bezel, scratch-resistant sapphire crystal with anti-reflective treatment on both sides, blue dial, self-winding chronometer Omega 9300 movement with Co-Axial Escapement, chronograph, date, and small seconds, approximately 60 hours of power reserve, blue leather strap. Water resistant to 100 m.
42.5 mm grey ceramic case, transparent back, ceramic bezel with tachymeter scale in white Super-LumiNova, scratch-resistant sapphire crystal with anti-reflective treatment on both sides, sand-blasted platinum 950 dial, self-winding chronometer Omega 9300 movement with Co-Axial Escapement, chronograph, date, and small seconds, approximately 60 hours of power reserve, grey leather strap. Water resistant to 50 m.